There were 690 million registered mobile money accounts as of December 2017. The digitization of a pre-existing behavior—sending and receiving money—is clearly valued in many markets. The digital finance community now has more than 10 years of person to person (P2P) experience on which to reflect: What have we learned about the impact of P2P on clients? 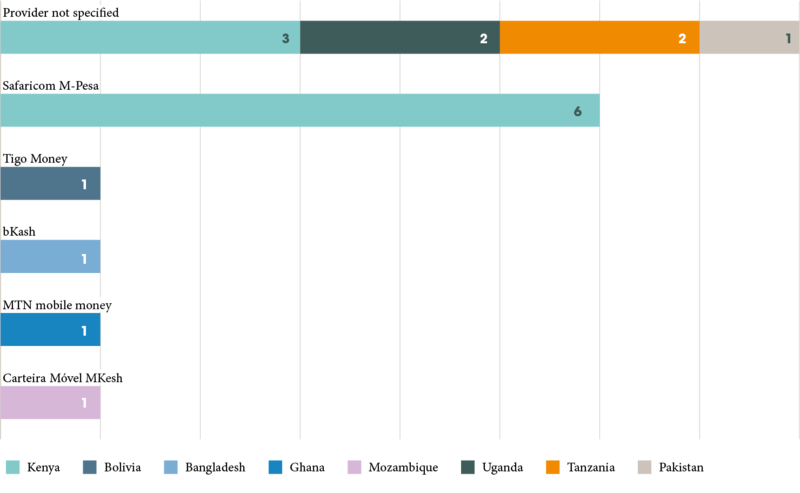 P2P studies account for 30% (18) of all digital finance products and eight countries in the EGM. The majority of studies focus on Kenya specifically and East Africa in general. Most studies examine P2P use generally rather than focusing on a specific P2P service. The mobile money channel is used in 100% of the products tested. These 18 studies comprise 57 outcome tests. The diagram below shows the outcomes tested and the number of studies that had a positive, negative, or null effect. Of the 18 products examined, 66.7% (12) reported exclusively positive results, 0% reported exclusively negative results, 5.6% (1) reported exclusively null results while 27.8% (5) reported mixed results. P2P has provided more privacy and thus control over financial resources, especially for female users. Overall, P2P digital transfers are more affordable than previous transfer methods. However, users with low digital literacy and numeracy may not benefit from all cost savings because of fraud or errors. Numerous studies have highlighted positive outcomes in sharing risk through remittances. However, two studies forefronted concerns for those who are sending money. We highlight a selection of insights gathered from an analysis of the P2P studies within the EGM and invite digital payment and transfer practitioners, researchers, donors, and policymakers to interact with the EGM to derive insights that match their needs and questions. Three Kenyan studies from 2008, 2009, and 2014 foregrounded how storing value in an eWallet has provided female clients with privacy and control over their finances. Women valued the decreased risk of their money being used by their husbands. Privacy was important in controlling how, on what, and when the money is spent. Women also appreciated having personal accounts without limiting account opening requirements, travel to banks, or the need to obtain permission from spouses. Digital payments theoretically reduce the cost of financial services whether through smaller fees, reductions in the cost of travel, opportunity costs of travel, or time savings. Supporting this theory, a 2008 study on M-Pesa found that users reported paying less for transfers compared with sending money on a bus or through the post office. They also reported sending more remittances due to the lower cost. However, a 2014 study found that digital transfers can sometimes cost more due to fraud, agent liquidity, and errors in sending to the wrong number. A popular hypothesis is that digital P2P presents a quick and convenient channel to receive money and thus share risk in times of economic stress. The majority of studies that tested this hypothesis found positive effects through a variety of mechanisms. Straightforward access to cash: Studies on M-Pesa from 2008, 2009, and 2012 showed that M-Pesa enhanced reciprocity and sharing during times of need, particularly for payments related to education, health, and funerals. Additionally, a 2008-2010 panel study on M-Pesa found that users were 11% more likely to receive remittances when faced with a shock and observed a 9.6% difference between users and non-users in education spending. Consumption and spending: In the first analysis of a 2008-2010 Kenyan panel study on M-Pesa, researchersfound that M-Pesa users increase their consumption expenditures by 11.8% during a financial shock, whereas non-users reduce theirs by 3%. In a second analysis of the data, researchers found that while non M-Pesa users saw on average a 7-10% drop in consumption during a financial shock, users did not experience a drop in consumption. In Uganda, a 2009-2012 panel study found a 13% increase in household per capita consumption following the adoption of mobile money services. Household shocks versus community shocks: A study using data from 2010-2013 in Tanzania examined the effects of mobile money when an aggregate shock—like a drought—occurs. In the absence of an aggregate shock, 36% of a village using mobile money results in a 4% to 10% higher rate of consumption per capita, indicating that mobile money users share remittances with the village. However, when an aggregate shock occurs, non-users experience a drop in consumption while households using mobile money do not. Thus, mobile money users are choosing not to share remittances when an aggregate shock occurs. 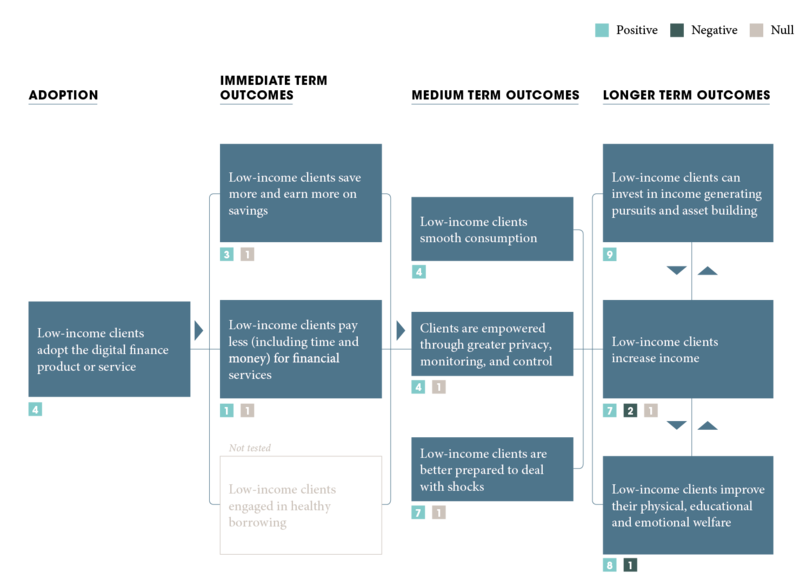 Researchers looked at P2P’s effects on welfare and income using a range of analytical approaches and looking at diverse client segments—many studies are 10 years old. Several studies optimized for the fact that mobile money services were widespread in the markets examined—and so could not be randomized or withheld—and used panel designs. These insights, while informative and foundational, should be read with care, as many speak to association rather than causation and do not isolate the mechanism of change. Physical security: A 2009 study on the community effects of M-Pesa, found that men especially identified physical security as an important outcome. Asset investment: A 2010 study on various P2P services in Kenyafound that users invest $42 more per year in agricultural inputs than non-users. Similarly, a 2009-2010 Kenyan panel study with farmers found that mobile money users were associated with higher spending on agricultural inputs. Looking at other business investments, two Kenyan studies from 2009 and 2013 provide insights into how M-Pesa aids business expansion through direct investment but also through increased money circulation and lower vendor transaction costs in obtaining stock. Income changes: Many income insights from P2P services come from the agricultural sector.A 2009-2010 Kenyan study on banana farmers, found that on average mobile money users earn $745 more per year than non-users. Similarly, a 2010 Kenyan study of farming households noted that mobile money users earned $224 more in farming activities per year than non-users. In Uganda a 2012-2015 study of coffee farmers found that mobile money use was associated with a 31% higher farm income. Food security: A 2009 study on community level effects of M-Pesa revealed positive insights on improved food security. The mechanisms cited include improved access to agricultural inputs and thus greater agricultural productivity. Increased money circulation was also related to improved food security. Additionally, a 2008-2010 panel study in Kenya observed a 9.1% difference in food expenditure among users and non-users of P2P. Rural households and migrants save more: Rural households were 43.7 percentage points more likely to save, and they saved 125% more than households in the control group. Migrants in the treatment group are 18 percentage points more likely to save and save 38.4% more than the control group by storing value in their bKash accounts, as seen in their month-end bKash balances. Migrants send more during shocks: Migrants in the treatment group whose rural households are hit by negative shocks send between 197% and 520% more remittances using bKash than migrants in the control group. But send less if they are hit with a negative health shock: When the paired migrant is hit by a negative health condition, the consumption of rural households in the treatment group is, overall, not statistically different from consumption in the control group. Education outcomes improve, but not through remittances: Children in the treatment group spent 0.25 hours more studying per week compared to the control group. Additionally, estimates for school attendance, enrollment, and performance are positive. However, parents are not using bKash remittances for education. Rather, the increase suggests that children may be swapping hours spent on household business activities with study. Another possible channel could be through the treatment impacts on health. Health outcomes improve: Households in the treatment group had 0.12 fewer members who were sick compared to the control group. The average medical expenses across all household members also decreased. Negative health impacts on migrants: Migrants in the treatment group had more difficulties with work and emotional problems. Overall the treatment decreased the health index of migrant households. This may be from the pressure to remit money back home. Change in economic status:Estimates shows that treated migrants were 10.8 percentage points less likely to live below the poverty line. Relative to digital savings and credit, P2P is the most fully formed, evidenced based pathway to client impact.The insights are numerous and often consolidating, permitting more confident conversations on the impact of P2P. P2P users, particularly women, value the ease of storing value and making and receiving transactions in privacy, allowing for more control over how their money is used. P2P transfers are touted as cost saving versus traditional methods of money transfers. Indeed this appears to be the case at face value, although those with limited digital literacy and/or numeracy may have different experiences due to fraud or genuine mistakes. Numerous tests have highlighted how users share risk and smooth consumption through quick access to remittances. More recent studies have followed the money flow from sender to receiver and back again, to confirm previous tests. However, money comes from somewhere and there are concerns regarding the pressure on those sending. But gaps remain. The clearest gap is in the markets tested. Studies have focused on East Africa where P2P services are widespread, but we cannot assume the same effects in all markets. Additionally, many of the studies that have looked at changes in welfare and income have not cleanly linked the change to P2P, i.e., whether the use of P2P catalyzed the change or the first P2P users were more likely to already be sophisticated business owners investing in assets that boost their income. As many of the first studies on the longer-term effects of P2P were panel designs, it is difficult to isolate the change mechanism. While these designs have developed a narrative around the long-term effects of P2P, only recently have studies begun to isolate the P2P mechanism and reveal insightful discoveries. FiDA is publishing a series on insights derived from an analysis of the latest digital finance Evidence Gap Map (EGM) update. This is the fourth blog. Digital savings—What do we know about the impact on clients? Digital credit—What do we know about the impact on clients? The studies in the EGM, represent our best knowledge of digital finance impact insights. New studies are ever emerging and thus the EGM will continue to evolve. If you have questions on the EGM, are interested in discussing research priorities, or know of relevant digital finance impact studies that meet the inclusion criteria, please contact ideas@financedigitalafrica.org.